[PDF] Give Me Liberty! : An American History (Seagull Fifth Edition) (Vol. 2) | Free eBooks Download - EBOOKEE! Description: The leading text in the U.S. survey course. Give Me Liberty! is the #1 book in the U.S. history survey course because it works in the classroom. A single-author text by a leader in the field, Give Me Liberty! delivers an authoritative, accessible, concise, and integrated American history. Updated with powerful new scholarship on borderlands and the West, the Fifth Edition brings new interactive History Skills Tutorials and Norton InQuizitive for History, the award-winning adaptive quizzing tool. The best-selling Seagull Edition is also available in full color for the first time. No comments for "[PDF] Give Me Liberty! 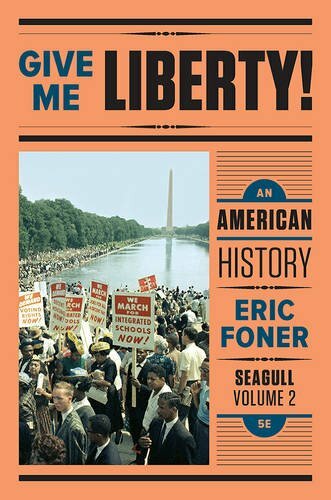 : An American History (Seagull Fifth Edition) (Vol. 2)".